Deep Dive bar is located at Amazon Spheres, a trio of greenery-filled, glass domes at the retail company's downtown Seattle campus. The bar occupies a small space at the base of the NBBJ-designed orbs, which made the shortlist for a 2018 Dezeen Award. Local studio Graham Baba Architects designed the bar to evoke the sensation of being on a journey. The front door is discretely tucked between two of the spheres. Upon entering, visitors travel down a gently sloping ramp and step into an environment that eschews minimalism in favour of "a rich array of materials and objects", the team said in a project description. 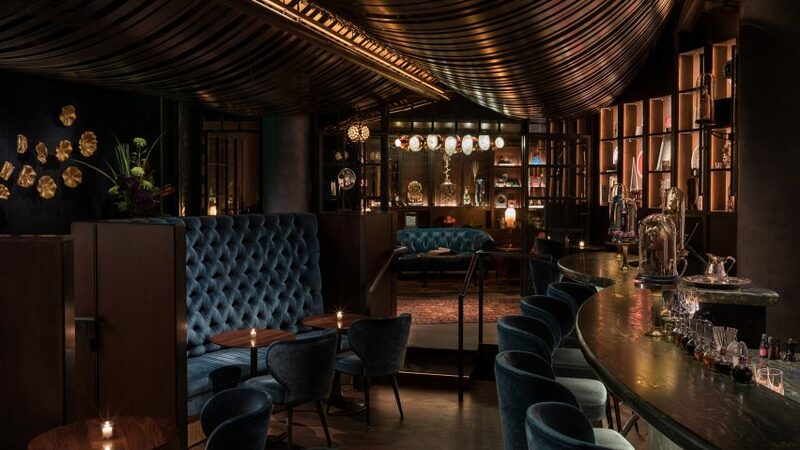 "Loosely inspired by a 1920s speakeasy, Deep Dive takes its aesthetic inspiration from the worlds of Charles Darwin and Jules Verne, capturing the human spirit of curiosity and imagination," the team said, referring to the British naturalist and the French novelist. Various types of seating – including a tufted banquette – are upholstered with dark blue velvet. The bar is lined with glass cloches filled with dried plants and small taxidermy. A glass-and-steel wall separates the main area from the library. Lush fabrics, dark-stained wood and antique furnishings were incorporated into the cosy nook. The team also added shelves for the display of unusual artifacts – making the area feel like "a veritable cabinet of curiosities". Deep Dive is the latest venture by Renee Erickson, a renowned local chef and restaurateur. In addition to an extensive cocktail list, the bar offers snacks such as cured salmon and caviar toast. Offerings are presented in a leather-bound menu. This is Graham Baba's second project at Amazon Spheres. The firm also designed Understory, a visitor centre and exhibition space. Other projects within the glass-orb development include Willmott's Ghost, a bright and airy restaurant designed by Heliotrope Architects and Price Erickson. Photography is by Haris Kenjar.